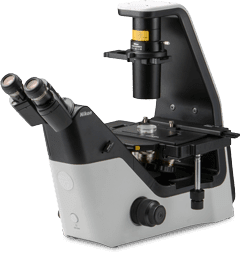 Inverted Routine Microscope Eclipse Ts2 | EINST Technology Pte Ltd.
Nikon’s all-new inverted routine microscope featuring a compact footprint, newly developed contrast observation method and improved operability. Utilizing Nikon’s industry-leading CFI60 optical system and LED illumination for both diascopic and epi-fluorescence imaging, the new Eclipse TS2 microscope offers brilliantly clear images, enabling more efficient cell culture observation and documentation. Furthermore, a newly developed contrast observation method and streamlined operation enhance its use for routine laboratory work. Two models are available to meet your needs; a diascopic illumination model, the Eclipse Ts2, and an epi-fluorescence illumination model, the Eclipse Ts2-FL. The compact, stable and durable body on both models conserves precious bench space and easily fits next to the incubator or inside a tissue culture hood. The new Contrast Shield accessory (optional) blocks room light, providing an easy and cost-effective method for achieving high signal-to-noise fluorescence observation in a typical, brightly lit culture room.